"With Bernstein as my inspiration, I pursued this dream." So wrote conductor Marin Alsop in a foreword to a recent book about Leonard Bernstein's Young People's Concerts. She's referring to a pivotal event in her life: the first time she saw Bernstein at one of those concerts. Her dream was to become a conductor, and that dream came true for Alsop. Many more Americans were inspired by Bernstein to pursue musical dreams: to become performers, conductors or teachers themselves. He also inspired a love of classical music in countless people across the world. The Young People's Concerts are only part of Leonard Bernstein's legacy as a teacher. There were other televised programs, lectures, broadcasts, recordings and his writing about music, too. His inspiration and influence is wide-ranging, and he incorporated what he knew and felt about music into everything he did. 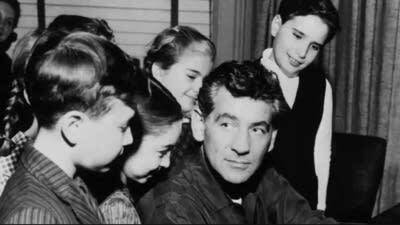 Bernstein believed that what made him a good teacher was his love of learning. His activities as music educator also pulled together all aspects of his professional life (conductor, composer, pianist) and gave voice to his personal qualities and interests. He was a humanitarian, a pacifist and endlessly enthusiastic about promoting music and musicians. He also conveyed a wider sense of music's role in the world  to promote understanding and communication. Through music, personal recollections including those of his son Alexander and Bernstein's own words, Leonard Bernstein: America's Music Teacher celebrates Bernstein's legacy as a born educator whose powerful influence extends to this day. Click on the player above to listen.